Toshiba Portege M400 table PC is a compact business laptop that features Intel Core Duo processor and 12.1″ Active Matrix SXGA Wide view tablet touch screen TFT LCD (1400×1050). 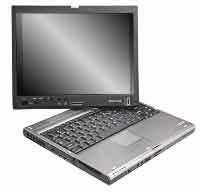 Despite its small size with dimensions of 295mm x 249mm x 38.9mm and weighs 2.038kg, Toshiba Portege M400 packs a lot of specifications such as two memory expansion slots, hard disk, USB2.0 port, Type II PC Card slot, 5-in-1 media reader, IEEE 1394a Firewire and 802.11a/b/g wireless LAN. TabletPc2 has reviewed Toshiba Portege M400-S933, and TablePCReviewSpot also reviews Toshiba Portege M400.